When it comes to anti-aging skincare ingredients, nothing beats Retinol! So, when one of my favorite brands introduces a new Retinol products, I am always all ears to find out about it! 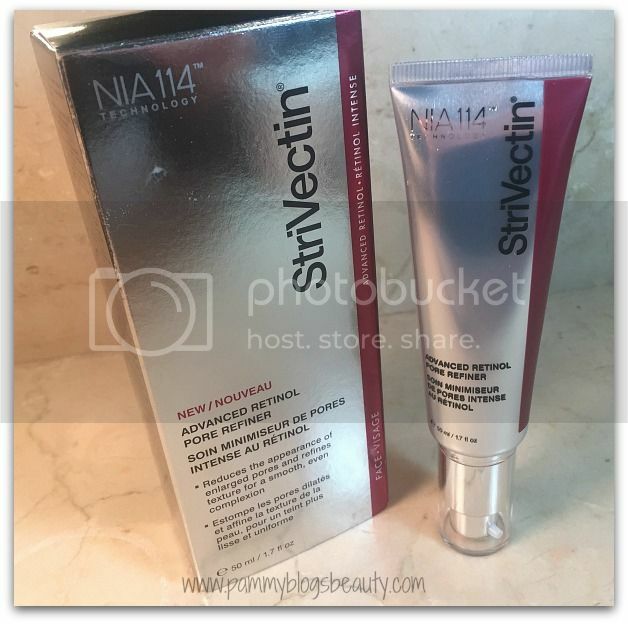 So, today, I am going to give you some information and my first impressions of the NEW StriVectin Advanced Retinol Pore Refiner. See Pores Half Their Size! New Advanced Retinol Pore Refiner is a lightweight daily pore-minimizing lotion and anti-aging moisturizer with Retinol that delivers both instant and long-term visible pore reduction. 96% of subjects had immediate improvement in pore size after a single application. Patented NIA-114TM technology nourishes the moisture barrier to provide visible age fighting efficacy as it limits the sensitivity common to Retinol use. The powerfully effective blend purifies and refines both skin tone and texture, while delivering superior age fighting benefits. This lightweight anti-aging moisturizer hydrates your skin and leaves it feeling fresh. The skin-loving beneficial ingredients (including Retinol and StriVectin's Patented NIA-114 amongst some other really good ingredients) work to reduce pore size, mattify your skin, and leaving your looking and feeling younger and more refreshed. Apply a thin layer in the mornings and evenings after cleansing. I use about 1 pump's worth for my whole face. This product should be the last step in your routine. Depending on your skin type, you might need a moisturizer with this product. My skin is combo skin (currently leaning towards combo-oily). So, I do not need an additional moisturizer with this product now. However, since I am introducing Retinol into my skincare rouine, I like layering it over an additional moisturizer to keep my skin calm (and to reduce the potential for irriation). As the weather gets colder, I will likely need to switch up to a heavier moisturizer with this product. For this review, I am giving my first-impressions only as I have only had the opportunity to try out this product for a short period of time (A couple weeks: a short period. So, I would not consider this a "full" review, just my first impressions). I do like this product! I like the lightweight feel. This product seems to leave my skin looking and feeling smoother and I feel that I do see a very slight improvement in my pores. Also, my skin is sensitive. However, I have not had any adverse reactions to the Retinol. I know that using Retinol can be tricky and there are some Retinol formulas that are too harsh for my skin. My skin seems to tolerate the StriVectin. I am modifying how I use it. I am applying at night only and when I do I apply over a moisturizer. I have had no sensitivity reactions with this product and have not had any breakouts during product testing. So, that is a plus! 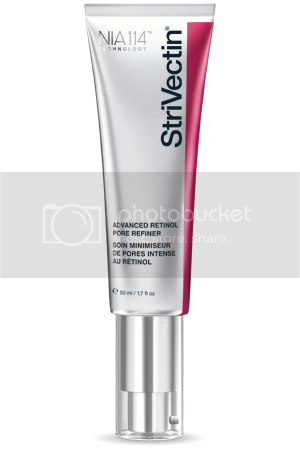 If you are looking to add a Retinol product into your routine to help you with keeping your pores clear and minimized, then you might want to consider this NEW StriVectin Advanced Retinol Pore Refiner! It is pricey at about $100 per tube. However, you know that you are getting a well-researched and effective product that can last you a long time (it only takes a small amount per application). ANYTHING to refine those pores!